WASHINGTON (CNS) – Although her work along the Texas-Mexico border has brought her fame and celebrity, Sister Norma Pimentel, a member of the Missionaries of Jesus, who is executive director of Catholic Charities of the Rio Grande Valley, shrugged that off as best she could Feb. 2 in Washington, D.C.
“What I do and what I’ve done is no different that what you all do,” Sister Pimentel told a rapt audience at a Feb. 2 dinner where she was given the Sister Margaret Cafferty Development of Peoples Award by the Catholic Campaign for Human Development (CCHD). “It’s our mission – what we accomplish together – that makes it happen,” Sister Pimentel added. CCHD, the U.S. bishops’ domestic anti-poverty agency, confers the award each year during the Catholic Social Ministry Gathering. Sister Norma told the story of how her work with immigrants in the U.S. without legal permission came to be in 2014. But it was the priest’s “Yes, Sister,” that stuck out most. “When do you hear a priest say, with no questions asked, ‘Here’s your parish hall’? It has to be God who made the stars aligned for all of us,” Sister Norma said. 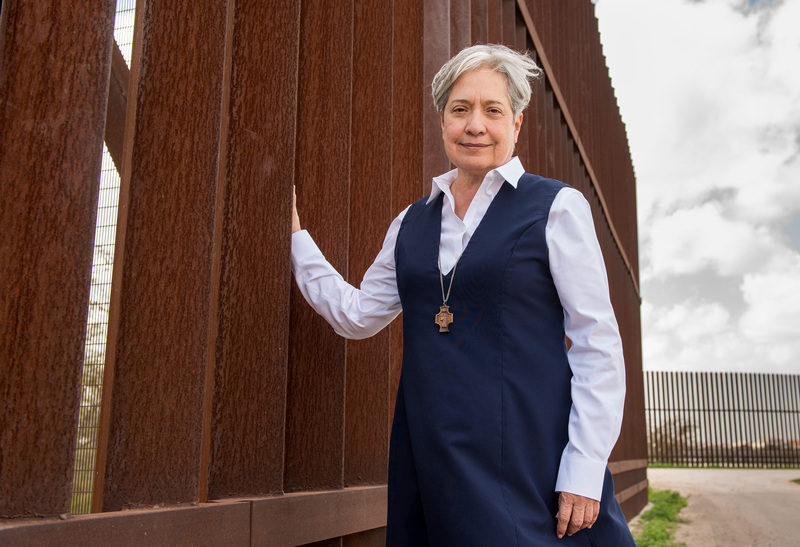 So much attention has come her way since her work on the border began, including a worldwide satellite broadcast in 2015 in which Pope Francis applauded her for her ministry. She serves as a consultant to the U.S. bishops’ Ad Hoc Committee Against Racism. She testified before the U.S. Commission on Civil Rights on civil rights in immigration and detention facilities, and spoke on women and dignity at the United Nations in 2015. In the past year, Sister Norma won the Keep the Dream Alive award from Catholic Charities USA, and the Laetare Medal from the University of Notre Dame. She also was nominated for Texan of the Year. “What we were doing in that shelter in McAllen, Texas, is helping thousands of families who arrive and have arrived. To date we have helped 125,000 people,” Sister Norma said to applause. “I don’t think he expected me to say that,” Sister Norma said. But her response sold him.